Below the bright lights of Broadway, there sits a long-forgotten architect’s model of the great Sovereign Theater. 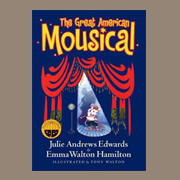 In this secret space, a troupe of theater mice busily rehearse their own show, “Broadway Airs.” Suddenly, the Sovereign is threatened by demolition, and Adelaide, the leading lady mouse, disappears. Will the little theater survive? And will the star return in time for opening night?